What do you do about Wax Moth? My first recommendation is to keep you colonies strong. Even a mildly decent colony of bees will keep the wax moth at bay. Colonies that get weak, or boxes/frames that have the bees removed.. IE; having wet supers you want to store are all prime targets. In this case my first recommendation is BT.. Xen Tari BT preferably, if you can find it.. This stuff can be sprayed on frames the bees are using, and it will not harm them. XenTari® is a highly selective insecticide for use against larvae (worms) of Lepidopterous insects. In particular, XenTari has shown outstanding efficacy against armyworms and diamondback moth larvae populations that are difficult to control with other insecticides. It is also effective against fungus gnats. The active ingredient in XenTari is a pure, potent strain of Bacillus thuringiensis var. aizawai (Bta) composed of protein crystals and viable endospores. The strain is patented. XenTari comes in a 1 lb package, in powder form. XenTari is approved for organic use by the Organic Materials Review Institute (OMRI). 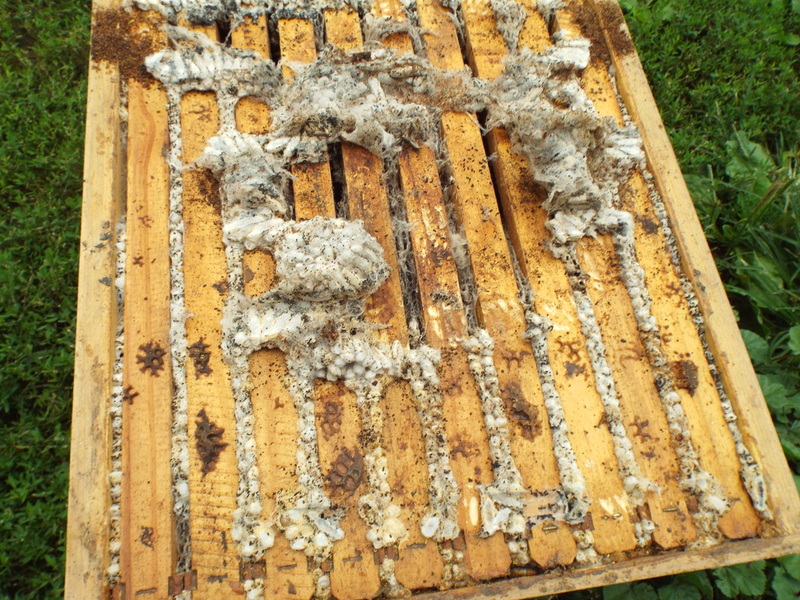 Bacillus thuringiensis var has no effect on the bees or their larvae, but the larvae of the wax moth are killed post haste. Spraying unused frames with this before storing guarantees you will have good usable frames come spring. Second choice is Para Moth Wax moth crystals. I use contractors garbage bags. Set a box on the bottom of the bag, then put about 5 or six boxes on top of it. I put one of my spacers on the last box. A paper plate on the frames of the top box and pour a handful of the crystals onto the plate, then seal the top of the bag with duct tape. The down side to useing Para moth is that I need to let the supers air out at LEAST a week before use, preferably two weeks in the spring. It took flipping this box upside down and using my foot to force those frames OUT of the box.. As I pulled those frames apart, there were literally hundreds of wax moth larvae wriggling through the cocoons and falling on the ground.. Had this been a medium box, i would have at least saved the frames, but being a deep, I felt there was only one sure fire solution that would permanently destroy any chance ANY of those larvae etc had to survive. Saving the larvae to use as fish bait is also an excellent use. Crappie and Bluegill go absolutely crazy over them. My wife wanted a drawn frame to put up on the top of the cupboard in the kitchen.. So I snagged her a beautiful newly drawn natural frame of foundation less comb. I put it on top of the kitchen cabinet.. In the open by itself. In the LIGHT all day long, and even most of the night it had light. It had NOTHING in it, no nectar, no pollen, no bee bread.. it was an empty frame of newly drawn wax. Two weeks later I happened to glance up at it, and saw the cocoons being spun.. I took it down and put it in the freezer for a week.. Took it out of the freezer, cleaned the bits of web off of it, and found a single tiny larvae I also removed, and put it back on the cabinet..
Two weeks later my wife told me there was spiders in my comb I needed to kill them and clean it up.. I looked up.. and sure enough, the wax moth were back. This time enough damage was done that it was not salvageable..
Another frame, Sprayed with BT has been on the cabinet for over two years with no issues yet. Freezing kills eggs, larvae and moths. In this area, taking that frame out of the freezer means it will have EGGS in it by the next morning, no matter where you set it. Keep your honey frames in the freezer until needed. Yes, it takes up space. Find an old freezer that works at a yard sale. 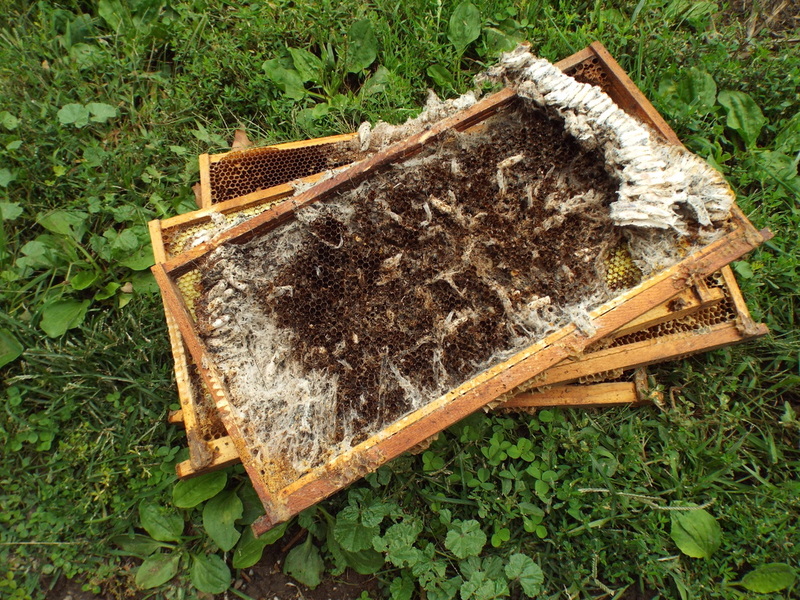 If the frames do not have honey in them, use BT, or Para moth crystals.. use crystals that do NOT have Naptha in them. 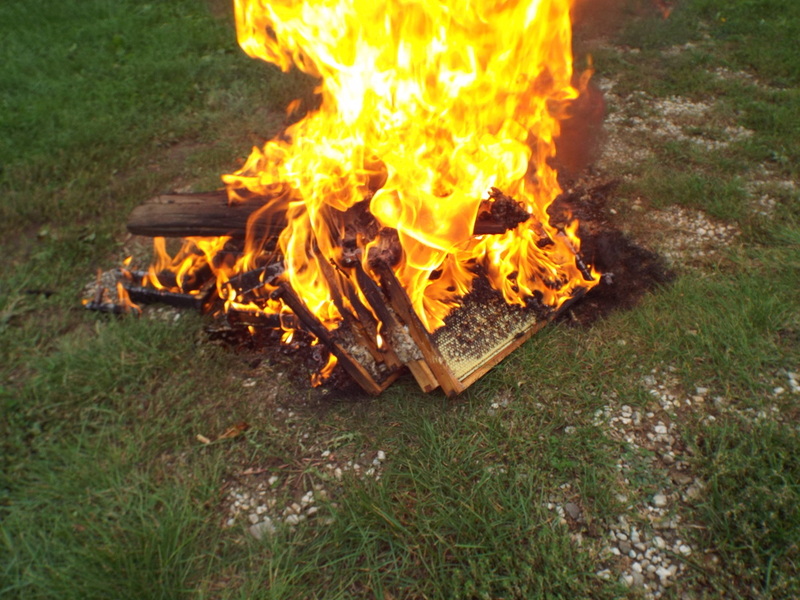 Naptha will be absorbed into the wax and the bees will not use it again.